"Methodist" redirects here. For other uses, see Methodism (disambiguation). "Methodist Church" redirects here. For other uses, see The Methodist Church (disambiguation). Wesley's theology focused on sanctification and the effect of faith on the character of a Christian. Distinguishing Methodist doctrines include the new birth, an assurance of salvation, imparted righteousness, the possibility of perfection in love, the works of piety, and the primacy of Scripture. Most Methodists teach that Jesus Christ, the Son of God, died for all of humanity and that salvation is available for all; in theology, this view is known as Arminianism. [nb 2] This teaching rejects the Calvinist position that God has pre-ordained the salvation of a select group of people. However, Whitefield and several other early leaders of the movement were considered Calvinistic Methodists and held to the Calvinist position. Methodism emphasises charity and support for the sick, the poor, and the afflicted through the works of mercy. These ideals are put into practice by the establishment of hospitals, orphanages, soup kitchens, and schools to follow Christ's command to spread the gospel and serve all people. Early Methodists were drawn from all levels of society, including the aristocracy,[nb 3] but the Methodist preachers took the message to labourers and criminals who tended to be left outside organised religion at that time. In Britain, the Methodist Church had a major effect in the early decades of the developing working class (1760–1820). In the United States, it became the religion of many slaves who later formed black churches in the Methodist tradition. For a detailed history of Methodism in Britain, see Methodist Church of Great Britain. The Methodist revival began with a group of men, including John Wesley (1703–1791) and his younger brother Charles (1707–1788), as a movement within the Church of England in the 18th century. The Wesley brothers founded the "Holy Club" at the University of Oxford, where John was a fellow and later a lecturer at Lincoln College. The club met weekly and they systematically set about living a holy life. They were accustomed to receiving Communion every week, fasting regularly, abstaining from most forms of amusement and luxury and frequently visited the sick and the poor, as well as prisoners. The fellowship were branded as "Methodist" by their fellow students because of the way they used "rule" and "method" to go about their religious affairs. John, who was leader of the club, took the attempted mockery and turned it into a title of honour. In 1735, at the invitation of the founder of the Georgia Colony, General James Oglethorpe, both John and Charles Wesley set out for America to be ministers to the colonists and missionaries to the Native Americans. Unsuccessful in their work, the brothers returned to England conscious of their lack of genuine Christian faith. They looked for help to Peter Boehler and other members of the Moravian Church. At a Moravian service in Aldersgate on 24 May 1738, John experienced what has come to be called his evangelical conversion, when he felt his "heart strangely warmed". He records in his journal: "I felt I did trust in Christ, Christ alone, for salvation; and an assurance was given me that He had taken away my sins, even mine, and saved me from the law of sin and death." Charles had reported a similar experience a few days previously. Considered a pivotal moment, Daniel L. Burnett writes: "The significance of [John] Wesley's Aldersgate Experience is monumental … Without it the names of Wesley and Methodism would likely be nothing more than obscure footnotes in the pages of church history." The Wesley brothers immediately began to preach salvation by faith to individuals and groups, in houses, in religious societies, and in the few churches which had not closed their doors to evangelical preachers. John Wesley came under the influence of the Dutch theologian Jacobus Arminius (1560–1609). Arminius had rejected the Calvinist teaching that God had pre-ordained an elect number of people to eternal bliss while others perished eternally. Conversely, George Whitefield (1714–1770), Howell Harris (1714–1773), and Selina Hastings, Countess of Huntingdon (1707–1791) were notable for being Calvinistic Methodists. 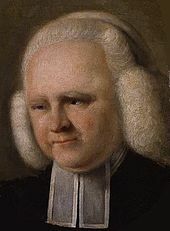 George Whitefield, returning from his own mission in Georgia, joined the Wesley brothers in what was rapidly to become a national crusade. Whitefield, who had been a fellow student of the Wesleys at Oxford, became well known for his unorthodox, itinerant ministry, in which he was dedicated to open-air preaching—reaching crowds of thousands. A key step in the development of John Wesley's ministry was, like Whitefield, to preach in fields, collieries and churchyards to those who did not regularly attend parish church services. Accordingly, many Methodist converts were those disconnected from the Church of England; Wesley remained a cleric of the Established Church and insisted that Methodists attend their local parish church as well as Methodist meetings. People are all, by nature, "dead in sin", and, consequently, "children of wrath". They are "justified by faith alone"
Wesley's organisational skills soon established him as the primary leader of the movement. Whitefield was a Calvinist, whereas Wesley was an outspoken opponent of the doctrine of predestination. Wesley argued (against Calvinist doctrine) that Christians could enjoy a second blessing—entire sanctification (Christian perfection) in this life: loving God and their neighbours, meekness and lowliness of heart and abstaining from all appearance of evil. These differences put strains on the alliance between Whitefield and Wesley, with Wesley becoming quite hostile toward Whitefield in what had been previously very close relations. Whitefield consistently begged Wesley not to let theological differences sever their friendship and, in time their friendship was restored, though this was seen by many of Whitefield's followers to be a doctrinal compromise. Many clergy in the established church feared that new doctrines promulgated by the Methodists, such as the necessity of a new birth for salvation—the first work of grace, of justification by faith and of the constant and sustained action of the Holy Spirit upon the believer's soul, would produce ill effects upon weak minds. Theophilus Evans, an early critic of the movement, even wrote that it was "the natural Tendency of their Behaviour, in Voice and Gesture and horrid Expressions, to make People mad." In one of his prints, William Hogarth likewise attacked Methodists as "enthusiasts" full of "Credulity, Superstition, and Fanaticism". Other attacks against the Methodists were physically violent—Wesley was nearly murdered by a mob at Wednesbury in 1743. The Methodists responded vigorously to their critics and thrived despite the attacks against them. Initially, the Methodists merely sought reform within the Church of England (Anglicanism), but the movement gradually departed from that Church. George Whitefield's preference for extemporaneous prayer rather than the fixed forms of prayer in the Book of Common Prayer, in addition to his insistence on the necessity of the New Birth, set him at odds with Anglican clergy. As Methodist societies multiplied, and elements of an ecclesiastical system were, one after another, adopted, the breach between John Wesley and the Church of England gradually widened. In 1784, Wesley responded to the shortage of priests in the American colonies due to the American Revolutionary War by ordaining preachers for America with power to administer the sacraments. This was a major reason for Methodism's final split from the Church of England after Wesley's death. This split created a separate, eventually worldwide, group of church denominations. With regard to the position of Methodism within Christendom, "John Wesley once noted that what God had achieved in the development of Methodism was no mere human endeavor but the work of God. As such it would be preserved by God so long as history remained." Calling it "the grand depositum" of the Methodist faith, Wesley specifically taught that the propagation of the doctrine of entire sanctification was the reason that God raised up the Methodists in the world. The influence of Whitefield and Lady Huntingdon on the Church of England was a factor in the founding of the Free Church of England in 1844. At the time of Wesley's death there were over 500 Methodist preachers in British colonies and the United States. Total membership of the Methodist societies in Britain was recorded as 56,000 in 1791, rising to 360,000 in 1836 and 1,463,000 by the national census of 1851. Early Methodism experienced a radical and spiritual phase that allowed women authority in church leadership. The role of the woman preacher emerged from the sense that the home should be a place of community care and should foster personal growth. Methodist women formed a community that cared for the vulnerable, extending the role of mothering beyond physical care. Women were encouraged to testify their faith. However the centrality of women's role sharply diminished after 1790 as Methodist churches became more structured and more male dominated. The Wesleyan Education Committee, which existed from 1838 to 1902, has documented the Methodist Church's involvement in the education of children. At first most effort was placed in creating Sunday Schools but in 1836 the British Methodist Conference gave its blessing to the creation of "Weekday schools". Methodism spread throughout the British Empire and, mostly through Whitefield's preaching during what historians call the First Great Awakening, in colonial America. After Whitefield's death in 1770, however, American Methodism entered a more lasting Wesleyan and Arminian phase of development. Catechism for the Use of the People Called Methodists. Methodist churches do not adhere to a definitive statement, or "confession", of belief (unlike the Westminster Confession used by Reformed churches). Many Methodist bodies, such as the African Methodist Episcopal Church and the United Methodist Church, base their doctrinal standards on Wesley's Articles of Religion, an abridgment of the Thirty-nine Articles of the Church of England that excised its Calvinist features. Some Methodist denominations also publish catechisms, which concisely summarise Christian doctrine. Methodists generally accept the Apostles' Creed and the Nicene Creed as declarations of shared Christian faith. Methodism also affirms the traditional Christian belief in the triune Godhead: Father, Son and Holy Spirit, as well as the orthodox understanding of the consubstantial humanity and divinity of Jesus Christ. Methodism emphasises doctrines that indicate the power of the Holy Spirit to strengthen the faith of believers and to transform their personal lives. Methodism is broadly evangelical in doctrine and is characterized by Wesleyan-Arminian theology. John Wesley is studied by Methodists for his interpretation of church practice and doctrine. At its heart, the theology of John Wesley stressed the life of Christian holiness: to love God with all one's heart, mind, soul and strength and to love one's neighbour as oneself. One popular expression of Methodist doctrine is in the hymns of Charles Wesley. Since enthusiastic congregational singing was a part of the early evangelical movement, Wesleyan theology took root and spread through this channel. Methodists believe Jesus Christ died for all humanity, not a limited few: the doctrine of unlimited atonement. A person is free not only to reject salvation but also to accept it by an act of free will. All people who are obedient to the gospel according to the measure of knowledge given them will be saved. The Holy Spirit assures a Christian of their salvation directly, through an inner "experience" (assurance of salvation). Christians in this life are capable of Christian perfection and are commanded by God to pursue it. After the first work of grace (the new birth), Methodist soteriology emphasizes the importance of the pursuit of holiness in salvation, a concept best summarized in a quote by Methodist evangelist Phoebe Palmer who stated that "justification would have ended with me had I refused to be holy." Thus, for Methodists, "true faith...cannot subsist without works". Methodism, inclusive of the holiness movement, thus teaches that "justification [is made] conditional on obedience and progress in sanctification", emphasizing "a deep reliance upon Christ not only in coming to faith, but in remaining in the faith." John Wesley taught that the keeping of the moral law contained in the Ten Commandments, as well as engaging in the works of piety and the works of mercy, were "indispensible for our sanctification". Methodists hold that sacraments are sacred acts of divine institution. Methodism has inherited its liturgy from Anglicanism, although American Methodist theology tends to have a stronger "sacramental emphasis" than that held by Evangelical Anglicans. In common with most Protestants, Methodists recognise two sacraments as being instituted by Christ: Baptism and Holy Communion (also called the "Lord's Supper", rarely the "Eucharist"). Most Methodist churches practice infant baptism, in anticipation of a response to be made later (confirmation), as well as believer's baptism. The Catechism for the use of the people called Methodists states that, "[in Holy Communion] Jesus Christ is present with his worshipping people and gives himself to them as their Lord and Saviour". The explanation of how Christ's presence is made manifest in the elements (bread and wine) is a "Holy Mystery". Methodist churches generally recognise sacraments to be a means of grace. John Wesley held that God also imparted grace by other established means such as public and private prayer, Scripture reading, study and preaching, public worship, and fasting. These constitute the Works of Piety. Wesley considered means of grace to be "outward signs, words, or actions ... to be the ordinary channels whereby [God] might convey to men, preventing [i.e., preparing], justifying or sanctifying grace". Specifically Methodist means, such as the class meetings, provided his chief examples for these prudential means of grace. Traditionally, Methodists declare the Bible (Old and New Testaments) to be the only divinely inspired Scripture and the primary source of authority for Christians. The historic Methodist understanding of Scripture is based on the superstructure of Wesleyan covenant theology. 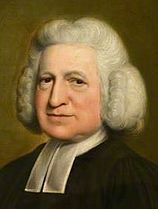 Methodists, stemming from John Wesley's own practices of theological reflection, also make use of tradition, drawing primarily from the teachings of the Church Fathers, as a source of authority. Though not infallible like holy Scripture, tradition may serve as a lens through which Scripture is interpreted. Theological discourse for Methodists almost always makes use of Scripture read inside the wider theological tradition of Christianity. It is a historical position of the church that any disciplined theological work calls for the careful use of reason. By reason, it is said, one reads and is able to interpret the Bible coherently and consistently. By reason one asks questions of faith and seeks to understand God's action and will. Methodism insists that personal salvation always implies Christian mission and service to the world. Scriptural holiness entails more than personal piety; love of God is always linked with love of neighbours and a passion for justice and renewal in the life of the world. Methodism was endowed by the Wesley brothers with worship characterised by a twofold practice: the ritual liturgy of the Book of Common Prayer on the one hand and the informal preaching service on the other. This twofold practice became distinctive of Methodism because worship in the Church of England was based, by law, solely on the Book of Common Prayer and worship in the Non-conformist churches was almost exclusively that of "services of the word", i.e. preaching services, with Holy Communion being observed infrequently. John Wesley's influence meant that, in Methodism, the two practices were combined, a situation which remains characteristic of the movement. The Lovefeast, traditionally practiced quarterly, was another practice that characterized early Methodism as John Wesley taught that it was an apostolic ordinance. In America, the United Methodist Church and Free Methodist Church, as well as the Primitive Methodist Church and Wesleyan Methodist Church, have a wide variety of forms of worship, ranging from high church to low church in liturgical usage. When the Methodists in America were separated from the Church of England because of the American Revolution, John Wesley himself provided a revised version of the Book of Common Prayer called The Sunday Service of the Methodists; With Other Occasional Services (1784). Today, the primary liturgical books of the United Methodist Church are The United Methodist Hymnal and The United Methodist Book of Worship. Congregations employ its liturgy and rituals as optional resources, but their use is not mandatory. These books contain the liturgies of the church that are generally derived from Wesley's Sunday Service and from the 20th-century liturgical renewal movement. The British Methodist Church is less ordered or liturgical in worship, but makes use of the Methodist Worship Book (similar to the Church of England's Common Worship), containing worship services (liturgies) and rubrics for the celebration of other rites, such as marriage. The Worship Book is also ultimately derived from Wesley's Sunday Service. A unique feature of American Methodism has been the observance of the season of Kingdomtide, encompassing the last 13 weeks before Advent, thus dividing the long season after Pentecost into two distinct segments. During Kingdomtide, Methodist liturgy has traditionally emphasised charitable work and alleviating the suffering of the poor. Christ has many services to be done. Some are easy, others are difficult. Some bring honour, others bring reproach. Some are suitable to our natural inclinations and temporal interests, others are contrary to both ... Yet the power to do all these things is given to us in Christ, who strengthens us. ...I am no longer my own but yours. Put me to what you will, rank me with whom you will; put me to doing, put me to suffering; let me be employed for you or laid aside for you, exalted for you or brought low for you; let me be full, let me be empty, let me have all things, let me have nothing; I freely and wholeheartedly yield all things to your pleasure and disposal. As John Wesley advocated outdoor evangelism, revival services are a traditional worship practice of Methodism that are often held in churches, as well as at camp meetings and at tent revivals. Early Methodists wore plain dress, with Methodist clergy condemning "high headdresses, ruffles, laces, gold, and 'costly apparel' in general". 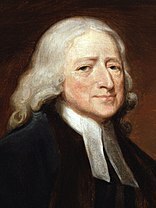 John Wesley recommended that Methodists annually read his thoughts On Dress; in that sermon, John Wesley expressed his desire for Methodists: "Let me see, before I die, a Methodist congregation, full as plain dressed as a Quaker congregation". The 1858 Discipline of the Wesleyan Methodist Connection thus stated that "we would ... ejoin on all who fear God plain dress". Peter Cartwright, a Methodist revivalist, stated that in addition to wearing plain dress, the early Methodists distinguished themselves from other members of society by fasting once a week, abstaining from alcohol, and devoutly observing the Sabbath. The early Methodists did not participate in, and condemned, "worldly habits" including "playing cards, racing horses, gambling, attending the theater, dancing (both in frolics and balls), and cockfighting". 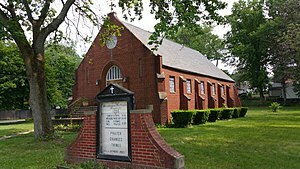 Over time, many of these practices were gradually relaxed in mainline Methodism, although practices such teetotalism and fasting are still very much encouraged, in addition to the current prohibition of gambling; denominations of the conservative holiness movement, such as the Allegheny Wesleyan Methodist Connection and Bible Methodist Connection of Churches, continue to reflect the spirit of the historic Methodist practice of wearing plain dress, encouraging members in "abstaining from the wearing of extravagant hairstyles, jewelry—to include rings, and expensive clothing for any reason". The General Rules of the Methodist Church in America, which are among the doctrinal standards of many Methodist Churches, promote first-day Sabbatarianism as they require "attending upon all the ordinances of God" including "the public worship of God" and prohibit "profaning the day of the Lord, either by doing ordinary work therein or by buying or selling". Today, millions belong to Methodist churches, which are present on all populated continents. Although Methodism is declining in Great Britain and North America, it is growing in other places; at a rapid pace in, for example, South Korea. There is no single Methodist Church with universal juridical authority; Methodists belong to multiple independent denominations or "connexions". The great majority of Methodists are members of denominations which are part of the international World Methodist Council, an association of 80 Methodist, Wesleyan and related united and uniting churches, representing over 80 million people. In 1956, the World Methodist Council established a permanent headquarters in the United States at Lake Junaluska, North Carolina. Methodism is prevalent in the English-speaking world but it is also organised in mainland Europe, largely due to missionary activity of British and American Methodists. British missionaries were primarily responsible for establishing Methodism across Ireland and Italy. Today the United Methodist Church (UMC)—a large denomination based in the United States—has a presence in Albania, Austria, Belarus, Belgium, Bulgaria, the Czech Republic, Croatia, Denmark, Estonia, Finland, France, Germany, Hungary, Latvia, Lithuania, Macedonia, Moldova, Norway, Poland, Romania, Sweden, Switzerland, Serbia, Slovakia and Ukraine. Collectively the European and Eurasian regions of the UMC constitute over 100,000 Methodists. Other smaller Methodist denominations exist in Europe. The original body founded as a result of Wesley's work came to be known as the Wesleyan Methodist Church. 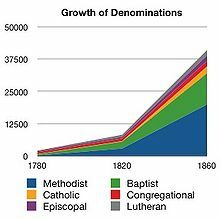 Schisms within the original Church, and independent revivals, led to the formation of a number of separate denominations calling themselves "Methodist". The largest of these were the Primitive Methodist church, deriving from a revival at Mow Cop in Staffordshire, the Bible Christians and the Methodist New Connexion. The original church became known as the Wesleyan Methodist Church to distinguish it from these bodies. In 1907, a union of smaller groups with the Methodist New Connexion and Bible Christian Church brought about the United Methodist Church (Great Britain), then the three major streams of British Methodism united in 1932 to form the current Methodist Church of Great Britain. The fourth-largest denomination in the country, the Methodist Church of Great Britain has about 202,000 members in 4,650 congregations. Wesley's Chapel in London was established by John Wesley, whose statue stands in the courtyard. Early Methodism was particularly prominent in Devon and Cornwall, which were key centers of activity by the Bible Christian faction of Methodists. The Bible Christians produced many preachers, and sent many missionaries to Australia. Methodism also grew rapidly in the old mill towns of Yorkshire and Lancashire, where the preachers stressed that the working classes were equal to the upper classes in the eyes of God. In Wales, three elements separately welcomed Methodism: Welsh-speaking, English-speaking, and Calvinistic. British Methodists, in particular the Primitive Methodists, took a leading role in the temperance movement of the 19th and early 20th centuries. Methodists saw alcoholic beverages, and alcoholism, as the root of many social ills and tried to persuade people to abstain from these. Temperance appealed strongly to the Methodist doctrines of sanctification and perfection. To this day, alcohol remains banned in Methodist premises, however this restriction no longer applies to domestic occasions in private homes (i.e. the minister may have a drink at home in the manse). The choice to consume alcohol is now a personal decision for any member. British Methodism does not have bishops; however, it has always been characterised by a strong central organisation, the Connexion, which holds an annual Conference (note that the Church retains the 18th-century spelling connexion for many purposes). The Connexion is divided into Districts in the charge of the Chair (who may be male or female). Methodist districts often correspond approximately, in geographical terms, to counties—as do Church of England dioceses. The districts are divided into circuits governed by the Circuit Meeting and led and administrated principally by a superintendent minister. 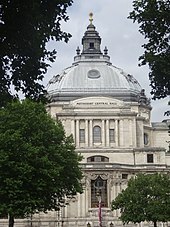 Ministers are appointed to Circuits rather than to individual churches, although some large inner-city churches, known as "central halls", are designated as circuits in themselves—of these Westminster Central Hall, opposite Westminster Abbey in central London, is the best known. Most circuits have fewer ministers than churches, and the majority of services are led by lay local preachers, or by supernumerary ministers (ministers who have retired, called supernumerary because they are not counted for official purposes in the numbers of ministers for the circuit in which they are listed). The superintendent and other ministers are assisted in the leadership and administration of the Circuit by Circuit Stewards, lay people who may have particular skills who collectively with the ministers form what is normally known as the Circuit Leadership Team. The Methodist Council also helps to run a number of schools, including two leading public schools in East Anglia: Culford School and the Leys School. It helps to promote an all round education with a strong Christian ethos. Other Methodist denominations in Britain include: The Salvation Army, founded by Methodist minister William Booth in 1865; the Free Methodist Church, a holiness church; the Church of the Nazarene; the Wesleyan Reform Union, an early secession from the Wesleyan Methodist Church; and the Independent Methodist Connexion. A Methodist chapel in Athlone, opened in 1865. John Wesley visited Ireland on at least twenty-four occasions and established classes and societies. The Methodist Church in Ireland (Irish: Eaglais Mheitidisteach in Éirinn) today operates across both Northern Ireland and the Republic of Ireland on an all-Ireland basis. As of 2013[update] there are around 50,000 Methodists across Ireland. The biggest concentration–13,171–is in Belfast, with 2,614 in Dublin. As of 2011[update] it is the fourth-largest denomination in Northern Ireland, with Methodists accounting for 3 percent of the population. Eric Gallagher was the President of the Church in the 1970s, becoming a well-known figure in Irish politics. He was one of the group of Protestant churchmen who met with Provisional IRA officers in Feakle, County Clare to try to broker peace. The meeting was unsuccessful due to a Garda raid on the hotel. The Methodist chapel in Rome houses Italian and English-speaking congregations. The Italian Methodist Church (Italian: Chiesa Metodista Italiana) is a small Protestant community in Italy, with around 7,000 members. Since 1975 it is in a formal covenant of partnership with the Waldensian Church, with a total of 45,000 members. Waldensians are a Protestant movement which started in Lyon, France, in the late 1170s. Italian Methodism has its origins in the Italian Free Church, British Wesleyan Methodist Missionary Society, and the American Methodist Episcopal Mission. These movements flowered in the second half of the 19th century in the new climate of political and religious freedom that was established with the end of the Papal States and unification of Italy in 1870. Bertrand M. Tipple, minister of the American Methodist Church in Rome, founded a college there in 1914. In April 2016 the World Methodist Council opened an Ecumenical Office in Rome. Methodist leaders and the leader of the Roman Catholic Church, Pope Francis, jointly dedicated the new office. It helps facilitate Methodist relationships with the wider Church, especially the Roman Catholic Church. Hammerfest Methodist Church in Norway was the world's most northerly Methodist congregation when established in 1890. The "Nordic and Baltic Area" of the United Methodist Church covers the Nordic countries (Denmark, Sweden, Norway, Finland) and the Baltic countries (Estonia, Latvia, Lithuania). Methodism was introduced to the Nordic countries in the late 19th century. 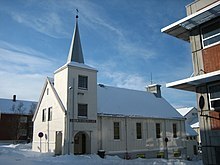 Today the United Methodist Church in Norway (Norwegian: Metodistkirken) is the largest church in the region with 10,684 members in total (as of 2013[update]). The French Methodist movement was founded in the 1820s by Charles Cook in the village of Congénies in Languedoc near Nîmes and Montpellier. The most important chapel of department was built in 1869, where there had been a Quaker community since the 18th century. Sixteen Methodist congregations voted to join the Reformed Church of France in 1938. In the 1980s, missionary work of a Methodist church in Agen led to new initiatives in Fleurance and Mont de Marsan. Methodism exists today in France under various names. The best-known is the Union of Evangelical Methodist Churches (French: l'Union de l'Eglise Evangélique Méthodiste) or UEEM. It is an autonomous regional conference of the United Methodist Church and is the fruit of a fusion in 2005 between the "Methodist Church of France" and the "Union of Methodist Churches". As of 2014[update], the UEEM has around 1,200 members and 30 ministers. Evangelisch-methodistische chapel at the foot of the Achalm mountain, Baden-Württemberg. The Protestant-Methodist Church (German: Evangelisch-methodistische Kirche) is the name of the United Methodist Church in Germany and Austria. The German church had about 52,031 members in 2015[update]. Members are organised into three conferences: north, east and south. Methodism is most prevalent in southern Saxony and around Stuttgart. British Methodist missionaries introduced Methodism to Germany in 1830, initially in the region of Württemberg. In 1859, the first Methodist minister arrived in Württemberg. Methodism was also spread in Germany through the missionary work of the American Methodist Episcopal Church, which began in 1849 in Bremen, soon spreading to Saxony. Early opposition towards Methodism was partly rooted in theological differences—northern and eastern regions of Germany were predominantly Lutheran and Reformed, and Methodists were dismissed as fanatics. Methodism was also hindered by its unfamiliar church structure (Connectionalism or Konnexionalismus), which was more centralised than the hierarchical polity in the Lutheran and Reformed churches. After World War I, the 1919 Weimar Constitution allowed Methodists to worship freely and many new chapels were established. In 1936, German Methodists elected their first bishop. The first Methodist mission in Hungary was established in 1898 in Bácska, in a then mostly German-speaking town of Verbász (since 1918 part of the Serbian province of Vojvodina). In 1905 a Methodist mission was established also in Budapest. In 1974, a group later known as the Hungarian Evangelical Fellowship seceded from the Hungarian Methodist Church over the question of interference by the communist state. As of 2017[update], the United Methodist Church in Hungary, known locally as the Hungarian Methodist Church (Hungarian: Magyarországi Metodista Egyház), has 453 professing members in 30 congregations. It runs two student homes, two homes for the elderly, the Forray Methodist High School, the Wesley Scouts and the Methodist Library and Archives. The church has a special ministry among the Roma. The seceding Hungarian Evangelical Fellowship (Magyarországi Evangéliumi Testvérközösség) also remains Methodist in its organisation and theology. It has eight full congregations and several mission groups, and runs a range of charitable organisations: hostels and soup kitchens for the homeless, a non-denominational theological college, a dozen schools of various kinds, and four old people's homes. Today there are a dozen Methodist/Wesleyan churches and mission organisations in Hungary, but all Methodist churches lost official church status under new legislation passed in 2011, when the number of officially recognised churches in the country fell to 14. However, the list of recognised churches was lengthened to 32 at the end of February 2012. This gave recognition to Hungarian Methodist Church and the Salvation Army, which was banned in Hungary in 1949 but had returned in 1990, but not to the Hungarian Evangelical Fellowship. The legislation has been strongly criticised by the Venice Commission of the Council of Europe as discriminatory. The Hungarian Methodist Church, the Salvation Army and the Church of the Nazarene and other Wesleyan groups formed the Wesley Theological Alliance for theological and publishing purposes in 1998. Today the Alliance has 10 Wesleyan member churches and organisations. The Hungarian Evangelical Fellowship does not belong to it and has its own publishing arm. The Methodist Church established several strongholds in Russia—Saint Petersburg in the west and the Vladivostok region in the east, with big Methodist centres right in the middle, in Moscow and Ekaterinburg (former Sverdlovsk). Methodists began their work in the west among Swedish immigrants in 1881 and started their work in the east in 1910. On 26 June 2009, Methodists celebrated the 120th year since Methodism arrived in Czarist Russia by erecting a new Methodist centre in Saint Petersburg. A Methodist presence was continued in Russia for 14 years after the Russian Revolution of 1917 through the efforts of Deaconess Anna Eklund. In 1939, political antagonism stymied the work of the Church and Deaconess Anna Eklund was coerced to return to her native Finland. After 1989, the Soviet Union allowed greatly increased religious freedoms and this continued after the USSR's collapse in 1991. During the 1990s, Methodism experienced a powerful wave of revival in the nation. Three sites in particular carried the torch—Samara, Moscow and Ekaterinburg. As of 2011[update], the United Methodist Church in Eurasia comprised 116 congregations, each with a native pastor. There are currently 48 students enrolled in residential and extension degree programs at the United Methodist Seminary in Moscow. Methodism came to the Caribbean in 1760 when the planter, lawyer and Speaker of the Antiguan House of Assembly, Nathaniel Gilbert (c. 1719–1774), returned to his sugar estate home in Antigua. A Methodist revival spread in the British West Indies due to the work of British missionaries. Missionaries established societies which would later become the Methodist Church in the Caribbean and the Americas (MCCA). The MCCA has about 62,000 members in over 700 congregations, ministered by 168 pastors. There are smaller Methodist denominations that have seceded from the parent church. The story is often told that in 1755, Nathaniel Gilbert, while convalescing, read a treatise of John Wesley, An Appeal to Men of Reason and Religion sent to him by his brother Francis. As a result of having read this book Gilbert, two years later, journeyed to England with three of his slaves and there in a drawing room meeting arranged in Wandsworth on 15 January 1759, met the preacher John Wesley. He returned to the Caribbean that same year and on his subsequent return began to preach to his slaves in Antigua. When Nathaniel Gilbert died in 1774 his work in Antigua was continued by his brother Francis Gilbert to approximately 200 Methodists. However, within a year Francis took ill and had to return to Britain and the work was carried on by Sophia Campbell ("a Negress") and Mary Alley ("a Mulatto"), two devoted women who kept the flock together with class and prayer meetings as best as they could. Baxter Memorial Church in English Harbour, Antigua. On 2 April 1778, John Baxter, a local preacher and skilled shipwright from Chatham in Kent, England, landed at English harbour in Antigua (now called Nelson's Dockyard) where he was offered a post at the naval dockyard. Baxter was a Methodist and had heard of the work of the Gilberts and their need for a new preacher. He began preaching and meeting with the Methodist leaders, and within a year the Methodist community had grown to 600 persons. 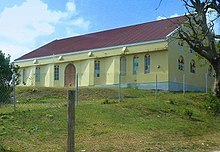 By 1783, the first Methodist chapel was built in Antigua, with John Baxter as the local preacher, its wooden structure seating some 2,000 people. In 1818 Edward Fraser (1798 – Aft. 1850), a privileged Barbadian slave, moved to Bermuda and subsequently met the new minister James Dunbar. The Nova Scotia Methodist Minister noted young Fraser's sincerity and commitment to his congregation and encouraged him by appointing him as assistant. By 1827 Fraser assisted in building a new chapel. He was later freed and admitted to the Methodist Ministry to serve in Antigua and Jamaica. Following William J. Shrewsbury's preaching in the 1820s, Sarah Ann Gill (1779–1866), a free-born black woman, used civil disobedience in an attempt to thwart magistrate rulings that prevented parishioners holding prayer meetings. In hopes of building a new chapel, she paid an extraordinary £1,700-0s-0d and ended up having militia appointed by the Governor to protect her home from demolition. In 1884 an attempt was made at autonomy with the formation of two West Indian Conferences, however by 1903 the venture had failed. It was not until the 1960s that another attempt was made at autonomy. This second attempt resulted in the emergence of the Methodist Church in the Caribbean and the Americas in May 1967. Francis Godson (1864–1953), a Methodist minister, who having served briefly in several of the Caribbean islands, eventually immersed himself in helping those in hardship of the First World War in Barbados. He was later appointed to the Legislative Council of Barbados, and fought for the rights of pensioners. He was later followed by renowned Barbadian Augustus Rawle Parkinson (1864–1932), who also was the first principal of the Wesley Hall School, Bridgetown in Barbados (which celebrated its 125th anniversary in September 2009). In more recent times in Barbados, Victor Alphonso Cooke (born 1930) and Lawrence Vernon Harcourt Lewis (born 1932) are strong influences on the Methodist Church on the island. Their contemporary and late member of the Dalkeith Methodist Church, was the former secretary of the University of the West Indies, consultant of the Canadian Training Aid Programme and a man of letters – Francis Woodbine Blackman (1922–2010). It was his research and published works that enlightened much of this information on Caribbean Methodism. Most Methodist denominations in Africa follow the British Methodist tradition and see the Methodist Church of Great Britain as their mother church. Originally modelled on the British structure, since independence most of these churches have adopted an episcopal model. The Nigerian Methodist Church is one of the largest Methodist denominations in the world and one of the largest Christian churches in Nigeria, with around two million members in 2000 congregations. It has seen exponential growth since the turn of the millennium. Christianity was established in Nigeria with the arrival in 1842 of a Wesleyan Methodist missionary. He had come in response to the request for missionaries by the ex-slaves who returned to Nigeria from Sierra Leone. From the mission stations established in Badagry and Abeokuta, the Methodist church spread to various parts of the country west of the River Niger and part of the north. In 1893 missionaries of the Primitive Methodist Church arrived from Fernando Po, an island off the southern coast of Nigeria. From there the Methodist Church spread to other parts of the country, east of the River Niger and also to parts of the north. The church west of the River Niger and part of the north was known as the Western Nigeria District and east of the Niger and another part of the north as the Eastern Nigeria District. Both existed independently of each other until 1962 when they constituted the Conference of Methodist Church Nigeria. The conference is composed of seven districts. The church has continued to spread into new areas and has established a department for evangelism and appointed a director of evangelism. An episcopal system adopted in 1976 was not fully accepted by all sections of the church until the two sides came together and resolved to end the disagreement. A new constitution was ratified in 1990. The system is still episcopal but the points which caused discontent were amended to be acceptable to both sides. Today, the Nigerian Methodist Church has a prelate, eight archbishops and 44 bishops. Methodist Church Ghana is one of the largest Methodist denominations, with around 800,000 members in 2,905 congregations, ministered by 700 pastors. It has fraternal links with the British Methodist and United Methodist churches worldwide. Methodism in Ghana came into existence as a result of the missionary activities of the Wesleyan Methodist Church, inaugurated with the arrival of Joseph Rhodes Dunwell to the Gold Coast in 1835. Like the mother church, the Methodist Church in Ghana was established by people of Protestant background. Roman Catholic and Anglican missionaries came to the Gold Coast from the 15th century. A school was established in Cape Coast by the Anglicans during the time of Philip Quaque, a Ghanaian priest. Those who came out of this school had Bible copies and study supplied by the Society for the Propagation of Christian Knowledge. A member of the resulting Bible study groups, William De-Graft, requested Bibles through Captain Potter of the ship Congo. Not only were Bibles sent, but also a Methodist missionary. In the first eight years of the Church's life, 11 out of 21 missionaries who worked in the Gold Coast died. Thomas Birch Freeman, who arrived at the Gold Coast in 1838 was a pioneer of missionary expansion. Between 1838 and 1857 he carried Methodism from the coastal areas to Kumasi in the Asante hinterland of the Gold Coast. He also established Methodist Societies in Badagry and AbeoKuta in Nigeria with the assistance of William De-Graft. By 1854, the church was organized into circuits constituting a district with T. B. Freeman as chairman. Freeman was replaced in 1856 by William West. The district was divided and extended to include areas in the then Gold Coast and Nigeria by the synod in 1878, a move confirmed at the British Conference. The district were Gold Coast District, with T.R. Picot as chairman and Yoruba and Popo District, with John Milum as chairman. Methodist evangelisation of northern Gold Coast began in 1910. After a long period of conflict with the colonial government, missionary work was established in 1955. Paul Adu was the first indigenous missionary to northern Gold Coast. Methodist chapel in Leliefontein, Northern Cape, South Africa. The Methodist Church operates across South Africa, Namibia, Botswana, Lesotho and Swaziland, with a limited presence in Zimbabwe and Mozambique. It is a member church of the World Methodist Council. 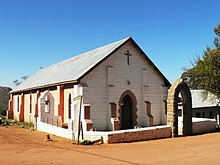 Methodism in Southern Africa began as a result of lay Christian work by an Irish soldier of the English Regiment, John Irwin, who was stationed at the Cape and began to hold prayer meetings as early as 1795. The first Methodist lay preacher at the Cape, George Middlemiss, was a soldier of the 72nd regiment of the British Army stationed at the Cape in 1805. This foundation paved the way for missionary work by Methodist missionary societies from Great Britain, many of whom sent missionaries with the 1820 English settlers to the Western and Eastern Cape. Among the most notable of the early missionaries were Barnabas Shaw and William Shaw. The largest group was the Wesleyan Methodist Church, but there were a number of others that joined together to form the Methodist Church of South Africa, later known as the Methodist Church of Southern Africa. The Methodist Church of Southern Africa is the largest mainline Protestant denomination in South Africa—7.3 percent of the South African population recorded their religious affiliation as 'Methodist' in the last national census. Methodism was brought to China in the autumn of 1847 by the Methodist Episcopal Church. The first missionaries sent out were Judson Dwight Collins and Moses Clark White, who sailed from Boston 15 April 1847, and reached Foochow 6 September. They were followed by Henry Hickok and Robert Samuel Maclay, who arrived 15 April 1848. 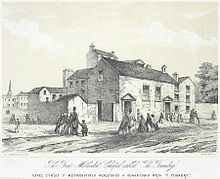 In 1857 it baptised the first convert in connection with its labours. In August 1856, a brick built church, called the "Church of the True God" (真神堂), the first substantial church building erected at Foochow by Protestant Missions, was dedicated to the worship of God. In the winter of the same year another brick built church, located on the hill in the suburbs on the south bank of the Min, was finished and dedicated, called the "Church of Heavenly Peace" (天安堂). In 1862, the number of members was 87. The Foochow Conference was organised by Isaac W. Wiley on 6 December 1867, by which time the number of members and probationers had reached 2,011. Rev. Hok Chau 周學 (also known as Lai-Tong Chau, 周勵堂) was the first Chinese ordained minister of the South China District of the Methodist Church (incumbent 1877–1916). Benjamin Hobson (1816–1873), a medical missionary sent by the London Missionary Society in 1839, set up a highly successful Wai Ai Clinic (惠愛醫館) Liang Fa (Leung Fat in Cantonese, 梁發, 1789–1855, ordained by the London Missionary Society), Hok Chau and others worked there. Rev. Liang (age 63) baptized Chau (quite young) in 1852. The Methodist Church based in Britain sent missionary George Piercy to China. In 1851, Piercy went to Guangzhou (Canton), where he worked in a trading company. In 1853, he started a church in Guangzhou. In 1877, Chau was ordained by the Methodist Church, where he pastored for 39 years. In 1947, the Methodist Church in the Republic of China celebrated its centenary. In 1949, however, the Methodist Church moved to Taiwan with the Kuomintang government. On 21 June 1953, Taipei Methodist Church was erected, then local churches and chapels with a baptized membership numbering over 2,500. Various types of educational, medical and social services are provided (including Tunghai University). 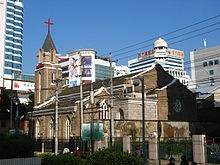 In 1972 the Methodist Church in the Republic of China became autonomous and the first bishop was installed in 1986. The CSI English Wesley Church in Broadway, Chennai, India, is one of the oldest Methodist chapels in India. Methodism came to India twice, in 1817 and in 1856, according to P. Dayanandan who has done extensive research on the subject. Thomas Coke and six other missionaries set sail for India on New Year's Day in 1814. Coke, then 66, died en route. Rev. James Lynch was the one who finally arrived in Madras in 1817 at a place called Black Town (Broadway), later known as George Town. 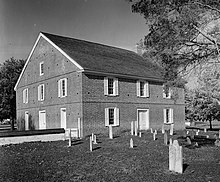 Lynch conducted the first Methodist missionary service on 2 March 1817, in a stable. The first Methodist church was dedicated in 1819 at Royapettah. A chapel at Broadway (Black Town) was later built and dedicated on 25 April 1822. This church was rebuilt in 1844 since the earlier structure was collapsing. At this time there were about 100 Methodist members in all of Madras, and they were either Europeans or Eurasians (European and Indian descent). Among names associated with the founding period of Methodism in India are Elijah Hoole and Thomas Cryer, who came as missionaries to Madras. In 1857, the Methodist Episcopal Church started its work in India, and with prominent evangelists like William Taylor the Emmanuel Methodist Church, Vepery, was born in 1874. The evangelist James Mills Thoburn established the Thoburn Memorial Church in Calcutta in 1873 and the Calcutta Boys' School in 1877. In 1947 the Wesleyan Methodist Church in India merged with Presbyterians, Anglicans and other Protestant churches to form the Church of South India while the American Methodist Church remained affiliated as the Methodist Church in Southern Asia (MCSA) to the mother church in USA- the United Methodist Church until 1981, when by an enabling act the Methodist Church in India (MCI) became an autonomous church in India. Today, the Methodist Church in India is governed by the General Conference of the Methodist Church of India headed by six Bishops, with headquarters at Methodist Centre, 21 YMCA Road, Mumbai, India. Missionaries from Britain, North America, and Australia founded Methodist churches in many Commonwealth countries. These are now independent and many of them are stronger than the former "mother" churches. In addition to the churches, these missionaries often also founded schools to serve the local community. A good example of such schools are the Methodist Boys' School in Kuala Lumpur, Methodist Girls' School and Methodist Boys' School in George Town, and Anglo-Chinese School, Methodist Girls' School, Paya Lebar Methodist Girls School and Fairfield Methodist Schools in Singapore. Methodism in the Philippines began shortly after the United States acquired the Philippines in 1898 as a result the Spanish–American War. On 21 June 1898, after the Battle of Manila Bay but before the Treaty of Paris, executives of the American Mission Society of the Methodist Episcopal Church expressed their desire to join other Protestant denominations in starting mission work in the islands and to enter into a Comity Agreement that would facilitate the establishment of such missions. The first Protestant worship service was conducted on 28 August 1898 by an American military chaplain named Rev. George C. Stull. Rev. Stull was an ordained Methodist minister from the Montana Annual Conference of The Methodist Episcopal Church (later part of the United Methodist Church after 1968). Methodist and Wesleyan traditions in the Philippines are shared by three of the largest mainline Protestant churches in the country: The United Methodist Church, Iglesia Evangelica Metodista En Las Islas Filipinas ("Evangelical Methodist Church in the Philippine Islands", abbreviated IEMELIF), and The United Church of Christ in the Philippines. There are also evangelical Protestant churches in the country of the Methodist tradition like the Wesleyan Church of the Philippines, Inc. the Free Methodist Church of the Philippines, and the Church of the Nazarene. There are also the IEMELIF Reform Movement (IRM), The Wesleyan (Pilgrim Holiness) Church of the Philippines, the Philippine Bible Methodist Church, Inc., the Pentecostal Free Methodist Church, Inc., the Fundamental Christian Methodist Church, The Reformed Methodist Church, Inc., The Methodist Church of the Living Bread, Inc., and the Wesley Evangelical Methodist Church & Mission, Inc. There are three Episcopal Areas of the United Methodist Church in the Philippines: the Baguio Episcopal Area, Davao Episcopal Area and Manila Episcopal Area. A call for autonomy from groups within the United Methodist Church in the Philippines was discussed at several conferences led mostly by episcopal candidates. This led to the establishment of the Ang Iglesia Metodista sa Pilipinas ("The Methodist Church in the Philippines") in 2010, led by Bishop Lito C. Tangonan, Rev. George Buenaventura, Chita Milan and Atty. Joe Frank E. Zuñiga. The group finally declared full autonomy and legal incorporation with the Securities and Exchange Commission was approved on 7 December 2011 with papers held by present procurators. It now has 126 local churches in Metro Manila, Palawan, Bataan, Zambales, Pangasinan, Bulacan, Aurora, Nueva Ecija, as well as parts of Pampanga and Cavite. Tangonan was consecrated as the denomination's first Presiding Bishop on 17 March 2012. The Korean Methodist Church (KMC) is one of the largest churches in South Korea with around 1.5 million members and 8,306 ministers. Methodism in Korea grew out of British and American mission work which began in the late 19th century. The first missionary sent out was Robert Samuel Maclay of the Methodist Episcopal Church, who sailed from Japan in 1884 and was given the authority of medical and schooling permission from emperor Gojong. The Korean church became fully autonomous in 1930, retaining affiliation with Methodist churches in America and later the United Methodist Church. The church experienced rapid growth in membership throughout most of the 20th century—in spite of the Korean War—before stabilizing in the 1990s. The KMC is a member of the World Methodist Council and hosted the first Asia Methodist Convention in 2001. There are many Korean-language Methodist churches in North America catering to Korean-speaking immigrants, not all of which are named as Methodist. The Methodist Church in Brazil was founded by American missionaries in 1867 after an initial unsuccessful founding in 1835. It has grown steadily since, becoming autonomous in 1930. In the 1970s it ordained its first woman minister. As of 2011[update], the Brazilian Methodist Church is divided into eight annual conferences with 162,000 members. The father of Methodism in Canada was William Black (1760–1834) who began preaching in settlements along the Petitcodiac River of New Brunswick in 1781. A few years afterwards, Methodist Episcopal circuit riders from the U.S. state of New York began to arrive in Canada West at Niagara, and the north shore of Lake Erie in 1786, and at the Kingston region on the northeast shore of Lake Ontario in the early 1790s. At the time the region was part of British North America and became part of Upper Canada after the Constitutional Act of 1791. Upper and Lower Canada were both part of the New York Episcopal Methodist Conference until 1810 when they were transferred to the newly formed Genesee Conference. Reverend Major George Neal began to preach in Niagara in October 1786, and was ordained in 1810 by Bishop Philip Asbury, at the Lyons, New York Methodist Conference. He was Canada's first saddlebag preacher, and travelled from Lake Ontario to Detroit for 50 years preaching the gospel. The spread of Methodism in the Canadas was seriously disrupted by the War of 1812 but quickly gained lost ground after the Treaty of Ghent was signed in 1815. In 1817 the British Wesleyans arrived in the Canadas from the Maritimes but by 1820 had agreed, with the Episcopal Methodists, to confine their work to Lower Canada (present-day Quebec) while the latter would confine themselves to Upper Canada (present-day Ontario). In the summer of 1818, the first place of public worship was erected for the Wesleyan Methodists in York, later Toronto. The chapel for the First Methodist Church was built on the corner of King Street and Jordan Street, the entire cost of the building was $250, an amount that took the congregation three years to raise. In 1828 Upper Canadian Methodists were permitted by the General Conference in the United States to form an independent Canadian Conference and, in 1833, the Canadian Conference merged with the British Wesleyans to form the Wesleyan Methodist Church in Canada. In 1884, most Canadian Methodists were brought under the umbrella of the Methodist Church, Canada. During the 19th century, Methodism played a large role in the culture and political affairs of Toronto. The city became known for being very puritanical with strict limits on the sale of alcohol and a rigorous enforcement of the Lord's Day Act. In 1925, the Methodist Church, Canada and most Presbyterian congregations, then by far the largest Protestant communion in Canada, most Congregational Union of Ontario and Quebec congregations, Union Churches in Western Canada, and the American Presbyterian Church in Montreal merged to form the United Church of Canada. In 1968, the Evangelical United Brethren Church's Canadian congregations joined after their American counterparts joined the United Methodist Church. The Methodist Church came to Mexico in 1872, with the arrival of two Methodist commissioners from the United States to observe the possibilities of evangelistic work in México. In December 1872, Bishop Gilbert Haven arrived to Mexico City, and he was ordered by M. D. William Butler to go to México. Bishop John C. Keener arrived from the Methodist Episcopal Church, South in January 1873. In 1874, M. D. William Butler established the first Protestant Methodist school of México, in Puebla. The school was founded under the name "Instituto Metodista Mexicano." Today the school is called "Instituto Mexicano Madero." It is still a Methodist school, and it is one of the most elite, selective, expensive and prestigious private schools in the country, with two campuses in Puebla State, and one in Oaxaca. A few years later the principal of the school created a Methodist university, the first and only Protestant university in Mexico. Wesley came to believe that the New Testament evidence did not leave the power of ordination to the priesthood in the hands of bishops but that other priests could ordain. In 1784, he ordained preachers for Scotland, England, and America, with power to administer the sacraments (this was a major reason for Methodism's final split from the Church of England after Wesley's death). At that time, Wesley sent Thomas Coke to America. Francis Asbury founded the Methodist Episcopal Church at the Baltimore Christmas Conference in 1784; Coke (already ordained in the Church of England) ordained Asbury deacon, elder, and bishop each on three successive days. Circuit riders, many of whom were laymen, travelled by horseback to preach the gospel and establish churches in many places. One of the most famous circuit riders was Robert Strawbridge who lived in the vicinity of Carroll County, Maryland soon after arriving in the Colonies around 1760. The First Great Awakening was a religious movement in the 1730s and 1740s, beginning in New Jersey, then spreading to New England, and eventually south into Virginia and North Carolina. The English Methodist preacher George Whitefield played a major role, traveling across the colonies and preaching in a dramatic and emotional style, accepting everyone as his audience. The new style of sermons and the way people practiced their faith breathed new life into religion in America. People became passionately and emotionally involved in their religion, rather than passively listening to intellectual discourse in a detached manner. People began to study the Bible at home. The effect was akin to the individualistic trends present in Europe during the Protestant Reformation. In the US, the number of local Methodist churches (blue) grew steadily; it was the largest denomination in the US by 1820. The Second Great Awakening was a nationwide wave of revivals, from 1790 to 1840. In New England, the renewed interest in religion inspired a wave of social activism among Yankees; Methodism grew and established several colleges, notably Boston University. In the "burned over district" of western New York, the spirit of revival burned brightly. Methodism saw the emergence of a Holiness movement. In the west, especially at Cane Ridge, Kentucky and in Tennessee, the revival strengthened the Methodists and the Baptists. Methodism grew rapidly in the Second Great Awakening, becoming the nation's largest denomination by 1820. From 58,000 members in 1790, it reached 258,000 in 1820 and 1,661,000 in 1860, growing by a factor of 28.6 in 70 years, while the total American population grew by a factor of eight. Other denominations also used revivals, but the Methodists grew fastest of all because "they combined popular appeal with efficient organization under the command of missionary bishops." Disputes over slavery placed the church in difficulty in the first half of the 19th century, with the northern church leaders fearful of a split with the South, and reluctant to take a stand. The Wesleyan Methodist Connexion (later renamed the Wesleyan Methodist Church) and the Free Methodist Churches were formed by staunch abolitionists, and the Free Methodists were especially active in the Underground Railroad, which helped to free the slaves. In 1968 the Wesleyan Methodist Church and Pilgrim Holiness Church merged to form the Wesleyan Church; a significant amount dissented from this decision resulting in the independence of the Allegheny Wesleyan Methodist Connection and the formation of the Bible Methodist Connection of Churches, both of which fall within the conservative holiness movement. In a much larger split, in 1845 at Louisville, the churches of the slaveholding states left the Methodist Episcopal Church and formed The Methodist Episcopal Church, South. The northern and southern branches were reunited in 1939, when slavery was no longer an issue. In this merger also joined the Methodist Protestant Church. Some southerners, conservative in theology, opposed the merger, and formed the Southern Methodist Church in 1940. In 1914–1917 many Methodist ministers made strong pleas for world peace. President Woodrow Wilson (a Presbyterian), promised "a war to end all wars," using language of a future peace that had been a watchword for the postmillennial movement. In the 1930s many Methodists favored isolationist policies. Thus in 1936, Methodist Bishop James Baker, of the San Francisco Conference, released a poll of ministers showing 56% opposed warfare. However, the Methodist Federation did call for a boycott of Japan, which had invaded China and was disrupting missionary activity there. In Chicago, 62 local African Methodist Episcopal churches voted their support for the Roosevelt administration's policy, while opposing any plan to send American troops overseas to fight. When war came in 1941, the vast majority of Methodists strongly supported the national war effort, but there were also a few (673) conscientious objectors. The "cross and flame" logo of the United Methodist Church. The United Methodist Church (UMC) was formed in 1968 as a result of a merger between the Evangelical United Brethren Church (EUB) and The Methodist Church. The former church had resulted from mergers of several groups of German Methodist heritage, however there was no longer any need or desire to worship in the German language. The latter church was a result of union between the Methodist Protestant Church and the northern and southern factions of the Methodist Episcopal Church. The merged church had approximately nine million members as of the late 1990s. While United Methodist Church in America membership has been declining, associated groups in developing countries are growing rapidly. Prior to the merge that led to the formation of the United Methodist Church, the Evangelical Methodist Church entered into a schism with the Methodist Church, citing modernism in its parent body as the reason for the departure in 1946. 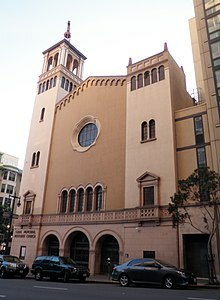 A Methodist congregation, Glide Memorial Church has served as a counter-culture rallying point and has been identified as a liberal church. American Methodist churches are generally organized on a connectional model, related, but not identical to that used in Britain. Pastors are assigned to congregations by bishops, distinguishing it from presbyterian government. Methodist denominations typically give lay members representation at regional and national Conferences at which the business of the church is conducted, making it different from most episcopal government. This connectional organizational model differs further from the congregational model, for example of Baptist, and Congregationalist Churches, among others. In addition to the United Methodist Church, there are over 40 other denominations that descend from John Wesley's Methodist movement. Some, such as the African Methodist Episcopal Church, the Free Methodists and the Wesleyan Church (formerly Wesleyan Methodist), are explicitly Methodist. There are also independent Methodist churches, many of which are affiliated with the Association of Independent Methodists. Others do not call themselves Methodist, but grew out of the Methodist movement: for example, The Salvation Army and the Church of the Nazarene. Some of the charismatic or Pentecostal churches such as the Pentecostal Holiness Church and the Assemblies of God USA also have roots in or draw from Wesleyan thought. The Holiness Revival was primarily among people of Methodist persuasion, who felt that the church had once again become apathetic, losing the Wesleyan zeal. Some important events of this revival were the writings of Phoebe Palmer during the mid-1800s, the establishment of the first of many holiness camp meetings at Vineland, New Jersey in 1867, and the founding of Asbury College, (1890), and other similar institutions in the U.S. around the turn of the 20th century. An Australasian General Conference, meeting triennially, for Australasia was established in 1875, with Annual Conferences in each colony (including New Zealand). Various branches of Methodism in Australia merged during the 20 years from 1881. The Methodist Church of Australasia was formed on 1 January 1902 when five Methodist denominations in Australia – the Wesleyan Methodist Church, the Primitive Methodists, the Bible Christian Church, the United Methodist Free and the Methodist New Connexion Churches came together. In polity it largely followed the Wesleyan Methodist Church. The only sizable Methodist group outside this new structure were the Lay Methodists. In 1945 the Rev. Dr. Kingsley Ridgway offered himself as a Melbourne-based "field representative" for a possible Australian branch of the Wesleyan Methodist Church of America, after meeting an American serviceman who was a member of that denomination. The Wesleyan Methodist Church of Australia was founded on his work. The Methodist Church of Australasia merged with the majority of the Presbyterian Church of Australia and the Congregational Union of Australia in 1977, becoming the Uniting Church. The Wesleyan Methodist Church of Australia and some independent congregations chose not to join the union. From the mid-1980s a number of independent Methodist churches were founded by missionaries and other members from the Methodist Churches of Malaysia and Singapore. Some of these came together to form what is now known as the Chinese Methodist Church in Australia in 1994, electing its first bishop in 2002. Since the 2000s many independent Methodist churches have been established or grown by Tongan immigrants. Many Pacific Islander immigrants of a Methodist background have also joined Uniting Church congregations. Wesley Mission in Pitt Street, Sydney, the largest parish in the Uniting Church, remains strongly in the Wesleyan tradition. As a result of the early efforts of missionaries, most of the natives of the Fiji Islands were converted to Methodism in the 1840s and 1850s. Most ethnic Fijians are Methodists today (the others are largely Roman Catholic and further divided into minor denominations such as Baptist, All Nations, Assemblies of God, Christian Mission Fellowship, Jehovah's Witnesses, Church of Latter Day Saints, Souls to Jesus and a few others), and the Methodist Church of Fiji and Rotuma is an important social force. Since the early 1990s, missionaries and Methodist Church members from Malaysia and Singapore established Churches around major centres in New Zealand. These congregations came together to form The Chinese Methodist Church In New Zealand (CMCNZ) in 2003, and constituted as a Provisional Annual Conference to elect its first president in 2018. Methodism had a particular resonance with the inhabitants of Tonga. As of 2006[update] somewhat more than a third of Tongans adhered to the Methodist tradition. Methodism is represented on the island by a number of churches including the Free Church of Tonga and the Free Wesleyan Church, which is the largest church in Tonga. The royal family of the country are prominent members, and the late king was a lay preacher. Many Methodists have been involved in the ecumenical movement, which has sought to unite the fractured denominations of Christianity. Because Methodism grew out of the Church of England, a denomination from which neither of the Wesley brothers seceded, some Methodist scholars and historians, such as Rupert E. Davies, have regarded their 'movement' more as a preaching order within wider Christian life than as a church, comparing them with the Franciscans, who formed a religious order within the medieval European church and not a separate denomination. Certainly, Methodists have been deeply involved in early examples of church union, especially the United Church of Canada and the Church of South India. Also, a disproportionate number of Methodists take part in inter-faith dialogue. For example, Wesley Ariarajah, a long-serving director of the World Council of Churches' sub-unit on "Dialogue with People of Living Faiths and Ideologies" is a Methodist. "Together we confess: By grace alone, in faith in Christ's saving work and not because of any merit on our part, we are accepted by God and receive the Holy Spirit, who renews our hearts while equipping and calling us to good works... as sinners our new life is solely due to the forgiving and renewing mercy that God imparts as a gift and we receive in faith, and never can merit in any way," affirming "fundamental doctrinal agreement" concerning justification between the Catholic Church, the LWF, and the World Methodist Council. 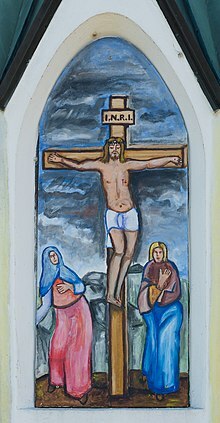 This is not to say there is perfect agreement between the three denominational traditions; while Catholics and Methodists believe that salvation involves cooperation between God and man, Lutherans believe that God brings about the salvation of individuals without any cooperation on their part. Methodist denominations in the United States have also strengthened ties with other Christian traditions. 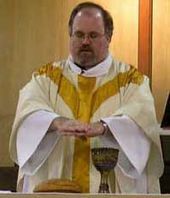 In April 2005, bishops in the United Methodist Church approved A Proposal for Interim Eucharistic Sharing. This document was the first step toward full communion with the Evangelical Lutheran Church in America (ELCA). The ELCA approved this same document in August 2005. At the 2008 General Conference, the United Methodist Church approved full communion with the Evangelical Lutheran Church in America. The UMC is also in dialogue with the Episcopal Church for full communion by 2012. The two denominations are working on a document called "Confessing Our Faith Together." ^ As of 2013[update]. This figure is an estimate by the World Methodist Council and includes members of united and uniting churches with Methodist participation. It represents approximately 60 million committed members and a further 20 million adherents. ^ a b Arminianism is named after Jacobus Arminius, a Dutch theologian who was trained to preach Calvinism but concluded that some aspects of Calvinism had to be modified in the light of Scripture. His opposition to some of the teachings of the Belgic Confession was formalized into Five Articles of Remonstrance, published posthumously by his followers in 1610. Arminians as well as Calvinists appeal to various Scriptures and the early Church Fathers to support their respective views, however the differences remain—Arminianism holds to the role free will in salvation and rejects the doctrines of predestination and election. John Wesley was perhaps the clearest English proponent of Arminian theology. ^ This social analysis is a summary of a wide variety of books on Methodist history, articles in The Methodist Magazine, etc. Most of the Methodist aristocracy were associated with Selina Hastings, Countess of Huntingdon, who invited Methodist preachers to gatherings which she hosted. Methodists were leaders among Christians at that time in reaching out to the poorest of the working classes. A number of soldiers were also Methodists. ^ American Methodism. S.S. Scranton & Co. Retrieved 18 October 2007. But the most-noticeable feature of British Methodism is its missionary spirit, and its organized, effective missionary work. It takes the lead of all other denominations in missionary movements. From its origin, Methodism has been characterised for its zeal in propagandism. It has always been missionary. ^ "Member Churches". World Methodist Council. Retrieved 17 June 2013. ^ a b c Stokes, Mack B. (1998). Major United Methodist Beliefs. Abingdon Press. p. 95. ISBN 9780687082124. ^ a b c d e f A Catechism for the Use of the People Called Methodists. Peterborough [England]: Methodist Publishing House. 2000. ISBN 9781858521824. ^ a b "Wesley on Social Holiness" (PDF). The Methodist Church in Britain. Retrieved 18 October 2016. ^ Models for Christian Higher Education: Strategies for Survival and Success in the Twenty-First Century. William B. Eerdmans Publishing Company. Retrieved 18 October 2007. Wesleyan institutions, whether hospitals, orphanages, soup kitchens or schools, historically were begun with the spirit to serve all people and to transform society. ^ Tucker, Karen B. Westerfield (2001). American Methodist Worship. Oxford: Oxford University Press. ISBN 9780198029267. ^ A Collection of Hymns, for the use of the people called Methodists. T. Blanshard. Retrieved 31 December 2007. ^ "What We Believe – Founder of the United Methodist Church". United Methodist Church of Whitefish Bay. Archived from the original on 25 March 2008. Retrieved 1 August 2007. ^ An introduction to world Methodism. Cambridge University Press. Retrieved 31 December 2007. ^ "Lincoln College, Oxford, Famous Alumni, John Wesley (1703–1791)". Lincoln College, Oxford University. Retrieved 24 May 2011. ^ a b Fairchild, Mary. "Methodist Church History: A Brief History of the Methodist Denomination". About.com:Christianity. Retrieved 26 April 2013. ^ "The Holy Club". The Methodist Church in Britain. Retrieved 20 October 2016. ^ Ross, Kathy W.; Stacey, Rosemary. "John Wesley and Savannah". Retrieved 1 January 2017. ^ a b c d e f g h Hylson-Smith, Kenneth (1992). Evangelicals in the Church of England 1734-1984. Bloomsbury. pp. 17–21. ^ "Methodist Church". BBC. Retrieved 4 January 2017. ^ Stutzman, Paul Fike. Recovering the Love Feast: Broadening Our Eucharistic Celebrations. Wipf and Stock Publishers. p. 159. ISBN 9781498273176. Retrieved 4 January 2017. ^ John Wesley, The Works of the Reverend John Wesley, A. M. (1831) “A short history of Methodism,” II.1. Retrieved on 21 October 2016. ^ a b "John Wesley: Methodical pietist". Christianity Today. Retrieved 4 January 2017. ^ "The Wesley Center Online: A Plain Account of Christian Perfection". wesley.nnu.edu. Northwest Nazarene University. Retrieved 5 January 2017. ^ Charles H. Goodwin, "Vile or reviled? The causes of the anti-Methodist riots at Wednesbury between May, 1743 and April, 1744 in the light of New England revivalism." Methodist history 35.1 (1996): 14–28. ^ On anti-Methodist literary attacks see Brett C. McInelly, "Writing the Revival: The Intersections of Methodism and Literature in the Long 18th Century." Literature Compass 12.1 (2015): 12–21; McInelly, Textual Warfare and the Making of Methodism (Oxford, UP, 2014). ^ Prichard, Robert; Prichard, Robert. History of The Episcopal Church (Third Revised Edition). ^ Gibson, James. "Wesleyan Heritage Series: Entire Sanctification". South Georgia Confessing Association. Retrieved 30 May 2018. ^ Kathryn A. Broyles, "Mothering, catechesis, and ecclesial leadership: The women of early Methodism and their call to witness to the gospel of Christ." Methodist History 46.3 (2008): 141-156. ^ "A historical perspective on Methodist involvement in school education after Wesley" (PDF). The Methodist Church in Britain. Retrieved 6 June 2015. ^ Pritchard, Frank Cyril (1949) Methodist Secondary Education: A History of the Contribution of Methodism to Secondary Education in the United Kingdom. Epworth. ^ Vickers, Jason (1 November 2016). A Wesleyan Theology of the Eucharist: The Presence of God for Christian Life and Ministry. BookBaby. p. 350. ISBN 9780938162513. Retrieved 11 March 2017. ^ Melton, J. Gordon (1 January 2005). Encyclopedia of Protestantism. Infobase Publishing. p. 48. ISBN 9780816069835. Among the items deleted by Wesley as unnecessary for Methodists were articles on Of Works Before Justification, which in Calvinism are largely discounted, but in Methodism lauded; Of Predestination and Election, which Wesley felt would be understood in a Calvinist manner that the Methodists rejected; and Of the Traditions of the Church, which Wesley felt to be no longer at issue. ^ "Why do we say creeds?". The United Methodist Church. Retrieved 16 October 2016. ^ Communications, United Methodist. "The Articles of Religion of the Methodist Church". United Methodist Communications. The United Methodist Church. Retrieved 7 January 2017. ^ "Methodism | History, Beliefs, & Organization". Encyclopedia Britannica. Retrieved 5 February 2019. ^ Tillett, Wilbur Fisk (1907). A Statement of the Faith of World-wide Methodism. Publishing House of the M.E. Church, South. p. 12. Retrieved 11 March 2017. ^ Communications, United Methodist. "Our Wesleyan Heritage". The United Methodist Church. Retrieved 18 October 2016. ^ Roger E. Olson (2009). Arminian Theology: Myths and Realities. InterVarsity Press. p. 33. ^ John Wesley, Sermons on Several Occasions for further detail. ^ Olson, Roger E. (6 September 2002). The Mosaic of Christian Belief: Twenty Centuries of Unity & Diversity. InterVarsity Press. p. 281. ISBN 9780830826957. Two examples of Christian synergism are the Catholic reformer Erasmus, who was roughly contemporary with Luther, and the 17th-century Dutch theologian Arminius. John Wesley, founder of the Methodist tradition, was also a synergist with regard to salvation. ^ Olson, Roger E. (6 September 2002). The Mosaic of Christian Belief: Twenty Centuries of Unity & Diversity. InterVarsity Press. p. 281. ISBN 9780830826957. About one hundred and twenty-five years later, the English revivalist and Methodist founder Wesley taught the same basic syneristic view of salvation based on belief in God's prevenient grace enabling fallen sinners to respond freely to God's offer of saving grace. ^ Kennedy, David J. (22 April 2016). Eucharistic Sacramentality in an Ecumenical Context: The Anglican Epiclesis. Routledge. p. 75. ISBN 9781317140115. Retrieved 16 March 2017. Evangelical Anglicans in the main did not follow the sacramental emphasis of the Wesleys but tended to be Cranmerian in their eucharistic theology, rejecting any notion of an objective presence of Christ in the elements. ^ Herbermann, Charles, ed. (1913). "Methodism" . Catholic Encyclopedia. New York: Robert Appleton Company. ^ "This Holy Mystery". The United Methodist Church. 2004. Retrieved 23 June 2013. ^ "Means of Grace" (PDF). Methodist Church in Ireland. Retrieved 20 October 2016. ^ John Wesley, Standard Sermons (1871) “Sermon 16-The Means of Grace,” II.1. Retrieved on 20 October 2016. ^ Phillips, L. Edward (2014). "The Holy Communion as a Means of Grace and the Question of On-line Communion" (PDF). UMC General Board of Higher Education and Ministry. Retrieved 20 October 2016. ^ Rodes, Stanley J. (25 September 2014). From Faith to Faith: John Wesley’s Covenant Theology and the Way of Salvation. James Clarke & Co. ISBN 9780227902202. ^ "Wesleyan Quadrilateral, the". Glossary. United Methodist Church. Retrieved 13 September 2016. ^ Dawes, Stephen B. "The Spirituality of 'Scriptural Holiness'" (PDF). The European Methodist Theological Commission. Retrieved 20 October 2016. ^ a b Firth, Richard. "Methodist Worship" (PDF). University of Birmingham. Retrieved 7 February 2016. ^ Tovey, Phillip (24 February 2016). The Theory and Practice of Extended Communion. Routledge. pp. 40–49. ISBN 9781317014201. ^ Coe, Bufford W. (1996). John Wesley and Marriage. Lehigh University Press. p. 11. ISBN 9780934223393. ^ White, with an introduction by James F. (1984). John Wesley's Sunday service of the Methodists in North America. Nashville: Quarterly Review. ISBN 978-0687406326. ^ "Methodist Publishing: Resources Catalogue" (PDF). Methodist Publishing. Archived from the original (PDF) on 24 March 2014. Retrieved 24 March 2014. ^ Dresser, Thomas (4 May 2015). Martha's Vineyard: A History. Arcadia Publishing Incorporated. p. 57. ISBN 9781625849045. ^ Chilcote, Paul W.; Warner, Laceye C. (13 February 2008). The Study of Evangelism: Exploring a Missional Practice of the Church. Wm. B. Eerdmans Publishing. p. 206. ISBN 9780802803917. ^ a b Lyerly, Cynthia Lynn (24 September 1998). Methodism and the Southern Mind, 1770-1810. Oxford University Press. p. 39. ISBN 9780195354249. Retrieved 19 June 2017. ^ Journals of Wesley, Nehemiah Curnock, ed., London: Epworth Press 1938, p. 468. ^ Wesley, John (1999). "The Wesley Center Online: Sermon 88 - On Dress". Wesley Center for Applied Theology. Retrieved 19 June 2017. ^ Jones, Scott J. (2002). United Methodist Doctrine: The Extreme Center. Abingdon Press. p. 235. ISBN 9780687034857. ^ "Discipline of the Bible Methodist Connection of Churches" (PDF). 2014. pp. 33–34. Retrieved 19 June 2017. ^ Tucker, Karen B. Westerfield (27 April 2011). American Methodist Worship. Oxford University Press. p. 46. ISBN 9780199774159. ^ Abraham, William J.; Kirby, James E. (24 September 2009). The Oxford Handbook of Methodist Studies. Oxford University Press. p. 253. ISBN 9780191607431. ^ "Korean Methodist Church". World Council of Churches. Retrieved 23 April 2013. ^ "Who We Are". worldmethodistcouncil.org. World Methodist Council. Retrieved 8 January 2017. ^ "Central and Southern Europe". www.umc-europe.org. United Methodist Church Europe UMC / Evangelisch-Methodistische Kirche Europa. Retrieved 20 January 2017. The United Methodist Church in Central and Southern Europe consists of about 33'500 members and friends living in 16 countries. ^ a b "3.7.1 Statistical Reports, details" (Word doc.). The United Methodist Church - Northern Europe & Eurasia. Retrieved 20 January 2017. ^ a b c "Statistische Zahlen". 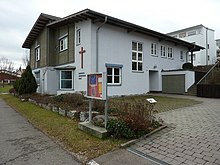 Evangelisch-methodistische Kirche (in German). Retrieved 20 January 2017. ^ "Deed of Union" (PDF). The Constitutional Practice and Discipline of the Methodist Church. The Methodist Church in Britain. Archived from the original (PDF) on 7 November 2012. Retrieved 5 July 2013. ^ "Methodism in Numbers – Statistics at a Glance" (PDF). methodist.org.uk. The Methodist Conference. July 2015. Archived from the original (PDF) on 23 December 2015. Retrieved 23 December 2015. ^ H. B. Workman (2012). Methodism. Cambridge UP. p. 97. ^ Glen O'Brien; Hilary M. Carey (2016). Methodism in Australia: A History. Routledge. p. 62. ^ Charles Yrigoyen Jr (2010). T&T Clark Companion to Methodism. A&C Black. p. 502. ^ Phil Carradice. "The temperance movement in Wales". BBC. Retrieved 20 April 2013. ^ a b "Alcohol". Views of the Church. The Methodist Church in Britain. Retrieved 20 April 2013. ^ "Wesleyan Reform Union of Churches". Thewru.com. Retrieved 19 April 2013. ^ "Welcome to IMCGB - Home page". Retrieved 15 September 2014. ^ "John Wesley in Ireland". Irish History Links. Retrieved 20 January 2017. ^ "Going beyond the church buildings and into the community". The Irish Times. 12 June 2013. Retrieved 20 January 2017. ^ "Census 2011: Key Statistics for Northern Ireland" (PDF). nisra.gov.uk. Retrieved 21 April 2013. ^ Taggart, Norman W. (2004). "Conflict, controversy and co-operation". Columba Press. p. 133. Retrieved 21 April 2013. ^ "Opera per le Chiese Metodiste in Italia". Evangelical Methodist Church in Italy. Archived from the original on 23 October 2013. Retrieved 22 April 2013. ^ a b "La diaspora Valdese" (in Italian). Chiesa Evangelica Valdese. Archived from the original on 24 July 2012. Retrieved 22 April 2013. ^ "Italian fact sheet" (Microsoft Word document). The Methodist Church in Britain. Retrieved 22 April 2013. ^ "METHODISTS BUY ROME SITE; Will Build a College in Connection with Mission Work" (PDF). The New York Times. 26 January 1914. ^ "World Methodist Council opens new ecumenical office in Rome". en.radiovaticana.va. Vatican Radio. 6 April 2016. Retrieved 21 May 2016. ^ "About the Methodist Ecumenical Office Rome". Methodist Church in Britain. Retrieved 21 May 2016. ^ a b Hassing, Arne (1991). Religion og makt : metodismen i norsk historie (in Norwegian). Trondheim: Tapir. pp. 35, 56. ISBN 82-519-0954-6. ISSN 0333-029X. ^ "Methodist influences in 19th century in France". Virtual Museum of Protestantism. Retrieved 2 February 2018. ^ a b "France". www.umc-europe.org. United Methodist Church Europe UMC / Evangelisch-Methodistische Kirche Europa. Retrieved 20 January 2017. ^ "France - General Board of Global Ministries". www.umcmission.org. Retrieved 20 January 2017. ^ "History of The United Methodist Church in Europe - The United Methodist Church". United Methodist Communications. ^ "The EMF in Hungary" (in German). United Methodist Church Europe UMC / Evangelisch-Methodistische Kirche Europa. Retrieved 20 January 2017. ^ Church site in Hungarian: Retrieved 18 September 2011. ^ John Wesley Theological College site: Retrieved 26 March 2012. ^ Die Welt, 21 March 2012: Retrieved 26 March 2012. ^ Hungarian Salvation Army site: Retrieved 18 September 2011. ^ Wesley Kiadó site in Hungarian: Retrieved 26 March 2012. ^ a b c d e "Centennial of Methodism in Russia observed". United Methodist Church. Archived from the original on 15 May 2011. Retrieved 29 December 2009. ^ "Develop United Methodist Center in St. Petersburg". United Methodist Church. Archived from the original on 15 June 2010. Retrieved 29 December 2009. ^ "Soviets OK New Religious Freedoms". deseretnews. Retrieved 11 May 2011. ^ a b c d "Methodist Church in the Caribbean and the Americas". oikoumene.org. World Council of Churches. Retrieved 20 January 2017. ^ "Baxter Memorial". methodistchurchantigua.org. Methodist Church of Antigua & Barbuda. Retrieved 20 January 2017. ^ a b c "Methodist Church Nigeria". World Council of Churches. Retrieved 25 March 2014. ^ "Life Coalition International - Jesus Is The Standard". Retrieved 15 September 2014. ^ a b "Methodist Church Ghana". oikoumene.org. World Council of Churches. Retrieved 20 January 2017. ^ F.L.Bartels. The Roots of Ghana Methodism. Cambridge: Cambridge University Press, 1965, pp. 12–18. ^ Millard-Jackson, J "Who called the tune? Methodist Missionary policy in South Africa during the 19th century" in Forster, D and Bentley, W. Methodism in Southern Africa: A celebration of Wesleyan Mission. Kempton Park. AcadSA publishers (2008:31). ^ "Official website of the Methodist Church of Southern Africa". Methodist.org.za. Retrieved 19 April 2013. ^ "回眸：当年传教士进羊城-MW悦读室之岭南话廊-凤凰网博客". Blog.ifeng.com. Archived from the original on 13 March 2013. Retrieved 19 April 2013. ^ "合信的《全体新论》与广东士林-《广东史志》1999年01期-中国知网". Mall.cnki.net. 3 February 2012. Retrieved 19 April 2013. ^ "Piloted to Serve". Facebook. Retrieved 19 April 2013. ^ "In commemoration of John Wesley". The Hindu. Chennai, India. 29 October 2004. ^ "The Methodist Church in India: Bangalore Episcopal Area". Gbgm-umc.org. Archived from the original on 24 May 2012. Retrieved 19 April 2013. ^ "uccp.ph". Retrieved 15 September 2014. ^ "Philippines Church of the Nazarene - Mabuhay!". Retrieved 15 September 2014. ^ "Manila Episcopal Area". Retrieved 15 September 2014. ^ "AIM Pilipinas Website". AIM Pilipinas. Retrieved 28 March 2012. ^ "Philippine Methodist". AIM Pilipinas. Retrieved 28 March 2012. ^ "AIM Pilipinas Blogsite". AIM Pilipinas. Retrieved 28 March 2012. ^ a b c d "Korean Methodist Church". oikoumene.org. World Council of Churches. Retrieved 23 January 2017. ^ Kim, Sebastian C. H.; Kim, Kirsteen. A History of Korean Christianity. Cambridge University Press. p. 100. ISBN 9781316123140. ^ Yrigoyen, Charles; Warrick, Susan E. (2013). Historical Dictionary of Methodism. Scarecrow Press. p. 219. ISBN 9780810878945. ^ Peppiatt, Liam. "Chapter 48: The First Methodist Church". Robertson's Landmarks of Toronto Revisited. ^ John Wesley Butler, History of the Methodist Episcopal Church in Mexico (Theclassics Us, 2013). ^ Karl M. Schmitt, "American Protestant Missionaries and the Diaz Regime in Mexico: 1876-1911." Journal of Church & State 25 (1983): 253. ^ "Instituto Mexicano Madero Plantel Centro". Imm.edu.mx. Archived from the original on 23 May 2013. Retrieved 19 April 2013. ^ "Universidad Madero de Puebla". Umad.edu.mx. Retrieved 19 April 2013. ^ Bratt, James D. (2006). Antirevivalism in Antebellum America: A Collection of Religious Voices. Rutgers UP. p. 15. ^ Lewis, James R. (2002). The Encyclopedia of Cults, Sects, and New Religions. Prometheus Books, Publishers. p. 356. ISBN 9781615927388. The Bible Methodist Connection of Tennessee, the Bible Holiness Church, and the Bible Methodist Connection of Churches were formed as a result of the opposition to the merger of the Wesleyan Methodist Church and the Pilgrim Holiness Church into the Wesleyan Church (1968). ^ Jewett, Robert; Wangerin, Ole (2008). Mission and menace: four centuries of American religious zeal. Fortress Press. p. 213. ^ Methodist World Peace Commission administered Civilian Public Service units at Duke University Hospital in Durham, North Carolina and Cherokee State (Psychiatric) Hospital in Cherokee, Iowa (list of CPS Camps). ^ "World Growth of the United Methodist Church in Comparative Perspective: A Brief Statistical Analysis - Robert". Retrieved 15 September 2014. ^ Garrett, James Leo; Hinson, E. Glenn; Tull, James E. (1983). Are Southern Baptists "Evangelicals"?. Mercer University Press. p. 47. ISBN 9780865540330. ^ Crespino, Joseph (2007). In Search of Another Country: Mississippi and the Conservative Counterrevolution. Princeton University Press. p. 169. ISBN 9780691122090. Retrieved 30 May 2017. ^ "METHODIST CHURCH OF AUSTRALASIA". The Sydney Morning Herald. National Library of Australia. 1 January 1902. p. 5. Retrieved 28 January 2016. ^ Humphreys, Robert; Rowland Ward (1986). Religious Bodies in Australia. Melbourne: Robert Humphreys and Rowland Ward. p. 45. ISBN 1-86252-709-1. ^ O'Brien, Glen (1996). Kingsley Ridgway: Pioneer with a Passion. Melbourne: Wesleyan Methodist Church. ^ Humphreys, Robert; Rowland Ward (1986). Religious Bodies in Australia. Melbourne: Robert Humphreys and Rowland Ward. p. 47. ISBN 1-86252-709-1. ^ "Table 25 in 2006 Census Data > QuickStats About Culture and Identity - Tables". Statistics New Zealand. Archived from the original on 14 March 2012. Retrieved 14 November 2011. ^ Fairbairn-Dunlop, Peggy (2003). Samoan women: widening choices. University of the South Pacific. p. 127. ISBN 982-02-0360-0. Retrieved 2 February 2010. ^ "government census of 2006 SPC - Tonga religion facts". Spc.int. Retrieved 19 April 2013. ^ Abraham, William J.; Kirby, James E. (2009). The Oxford Handbook of Methodist Studies. Oxford University Press. p. 394. ISBN 9780191607431. ^ Davies, Rupert E. (1985). Methodism (2nd rev. ed.). London: Epworth Press. ISBN 0-7162-0280-8. ^ Wesley Ariarajah. "S. Wesley Ariarajah". Drew University. Retrieved 21 April 2013. ^ "Methodist Association with the Joint Declaration on the Doctrine of Justification". Vatican.va. Archived from the original on 3 March 2013. Retrieved 19 April 2013. ^ "Vatican Radio, 2012, Methodist Viewpoint on Ecumenical Dialogue". Retrieved 15 September 2014. ^ Rev. Donald Bolan, Pontifical Council for Promoting Christian Unity, 'Catholic-Methodist relations: Working for a "joint living out of the Gospel Archived 3 March 2016 at the Wayback Machine"' 2007. ^ "Joint Commission for Dialogue Between the Roman Catholic Church and the World Methodist Council, 2006, "The Grace Given You in Christ: Catholics and Methodists Reflect Further on the Church". Archived from the original on 29 May 2014. Retrieved 15 September 2014. ^ "Anglican-Methodist Covenant". Anglican-methodist.org.uk. 1 November 2003. Retrieved 19 April 2013. ^ "Lutheran—United Methodist Dialogue". Evangelical Lutheran Church in America. Archived from the original on 12 June 2007. Retrieved 8 June 2007. ^ "Methodists yes to full communion with Lutherans; no on gay change". Ecumenical News International. Archived from the original on 9 January 2009. Retrieved 16 May 2007. ^ "Council approves interim pacts with Episcopalians, Lutherans". The United Methodist Church. Archived from the original on 7 July 2012. Retrieved 8 June 2007. Cracknell, Kenneth and White, Susan J. (2005) An Introduction to World Methodism, Cambridge University Press, ISBN 0-521-81849-4. Brooks, Alan (2010) West End Methodism: The Story of Hinde Street, London: Northway Publications, 400pp. Stigant, P. "Wesleyan Methodism and working-class radicalism in the north, 1792–1821." Northern History (1971) 6#1 pp: 98-116. Thompson, Edward Palmer. The making of the English working class (1963) a famous classic stressing the role of Methodism. Sweet, William Warren (1954) Methodism in American History, Revision of 1953, Nashville: Abingdon Press, 472 p.
Wikimedia Commons has media related to Methodism.